Home Magazine Cover Story Is Certification Right For You? In the early 1980s, just a few years after David Weaver graduated from his Indiana high school, its electronics program was cut due to a lack of funding. A similar story has been told in many rural communities since, he said. Eventually, districts banded together to establish regional vocational schools for the provision of technical education, but by then, Weaver had already begun a career in logistics, followed by a stint in insurance. Nonetheless, he still held out hope of working in education (and electronics), and eventually returned to the field, joining the research and test development department at ETA International (the Electronics Technicians Association) of Greencastle, Indiana. ETA was founded in 1978 as a nonprofit association of electronics technicians who gathered in the absence of more formally organized programs to troubleshoot one another’s technical concerns. Weaver describes them as “the radio guys, the TV guys; guys just getting out of the service, guys looking for jobs as college professors” who sought to advance their careers and those of their peers. Today, the agency provides more than 80 accredited, vendor-neutral certification programs in tech fields like fiber optics, communications, electronics, biomedical engineering, smart homes, and renewable energy, but its mission remains the same: to represent and support the technical professional in his or her chosen field of specialization. 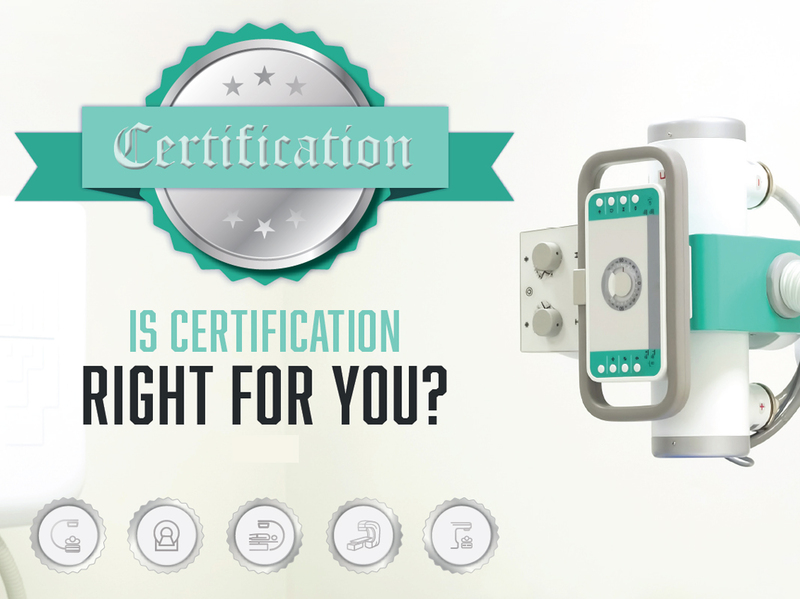 ETA International doesn’t provide any education itself; rather, it’s accredited by the International Certification Accreditation Council (ICAC) to certify the training that those technical professionals complete. Weaver sees his role as supporting technicians while they get their feet underneath them in a field that often presents younger workers with a chicken-and-egg problem: how to get their first jobs in an resume-driven career. To Weaver, certificate programs are equally valuable to any professional looking to enter a technical field, regardless of their formal education status. While a lot of companies want to train their new hires in their specific company’s practices, especially in the imaging service and biomedical space, certification programs offer a way for employers to know that their employees have had some hands-on experience, or at least some level of formal knowledge about the fundamental concepts in the field. He described biomedical technicians as working with “at least a journeyman’s level of experience” – a basic understanding of electronics and safety concerns, at minimum – principally because that’s required when working on patient safety equipment. In the past, the only pathways for many individuals who showed promise in the early stages of their careers would be to proceed to a college degree program for electrical engineering. Others would hone their chops in branches of the U.S. Armed Services, particularly the Navy or the Air Force. Many biomeds still enter the field via those channels, Weaver said, but with alternative accredited certificate programs, there are a broader variety of ways for prospective technicians to gain relevant qualifications. One area of growth for biomeds and HTM professionals includes making a move to specialize in imaging service. Smith said the bare minimum requirements for technicians at his company include a CBET certificate; from there, depending on what devices employees will be assigned to service, Elite Biomedical will pay for them to receive supplemental training at original equipment manufacturer (OEM) schools. Back-end, third-party support provision is a secondary line of business for Elite Biomedical, but Smith said the company seeks to differentiate itself among its competitors by certifying that its service professionals possess certifications in their areas of expertise. Although he estimates that only half his clients ask whether the staff are educated to such a level, Smith believes it’s important to employ trained professionals. Greg Johnson, co-owner of Southeastern Biomedical, said that without some proof of aptitude in the field – whether from a college, military school or certificate program – he won’t hire a service professional. Without the benefit of a global licensing program, such as those physicians and nurses complete, “we need some type of method to determine whether people are qualified or not,” he said. At some point in the not-too-distant future, however, such process improvement mechanisms may shift from being voluntary to being required by federal statute. Stephen Grimes, principal consultant at the Swampscott, Massachusetts-based Strategic Healthcare Technology Associates, thinks that day will come sooner rather than later. In 2018, OEMs lobbied the U.S. Food and Drug Administration(FDA) hard for regulatory action that would require all third-party medical equipment refurbishers, repairers, and servicers to adhere to standard guidelines defined by the manufacturers of that equipment. The FDA didn’t bite, indicating instead by its comments that it “would like very much to see the industry solve it itself,” Grimes said, adding that, regardless of the agency’s position, “the manufacturers are not going to stop” pushing for it. Grimes chairs the Healthcare Technology Certification Commission (HTCC) which certifies clinical engineers, and sits on the board of the AAMI Credentialing Institute (ACI), which offers certifications in biomedical, laboratory, and radiology equipment, sterilization, quality management, and healthcare technology management. He believes that the sooner imaging service and clinical engineering professionals and the companies that employ them progress toward credentialing, the better for the industry. Grimes believes the industry must approach the problem from a systems standpoint, developing credentialing programs that create an appropriately skilled workforce, and support the evolution of their talents as the jobs they perform likewise evolve. “It’s going to require continuous education, continuous on the job training, and getting new skills,” Grimes said. “It’s also likely that we will introduce additional levels of certification that requires the person to demonstrate that additional competency,” such as the continuing education credits requirements of other health care professionals. In the future, Grimes believes the evolution of that education could incorporate certifications in things like clinical systems engineering, cybersecurity, artificial intelligence, robotics or 3D imaging and printing. At some point, he said, credentialing agencies will make the determinations, based on industry surveys and other factors, as to which job classes and responsibilities will necessitate specialization. Whether a hospital customer asks for workers’ credentials or not prior to service being performed on its equipment, Grimes points out that the Center for Medicare and Medicaid Services requires that equipment be maintained by qualified staff. It is therefore the responsibility of the hospital contracting for the work to make sure that it’s being handled by qualified personnel. Grimes also believes that any approach to the standard begin with small steps. Generating buy-in from the imaging service and biomed community and incorporating its feedback will help groups like HTCC and ACI to develop more robust certification guidelines over time. He envisions a modestly priced certification exam that young imaging biomedical professionals could take after completing their schooling, and which increases incrementally in costs and work to advance, level by level.